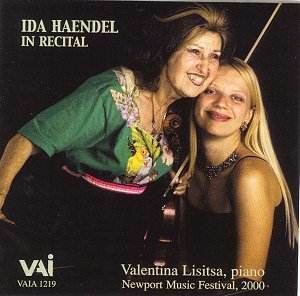 This recital was taped at the 2000 Newport Music Festival and is a welcome addition to Haendel�s relatively sparse live commercial discography. As ever she is a musician of pronounced musical viewpoints. Interestingly the only work discussed in the notes is the Chaconne (she doesn�t play the rest of the D minor Partita), in which Haendel writes for two intensely communicative pages about her changing approaches to it, from her analytical Flesch training through the then imperfectly understood influence of Enescu. His however remained the primary influence on her and she felt it was only many years later that she finally came to strip away extraneous impression and to play it as she felt it should be played. Her Sonatas and Partitas are available on Testament so her cycle of Bach works is not unknown to us. This live performance explores once again Haendel�s association with the Chaconne and allows one to hear her intensely rhapsodic way with it. Rapt, italicised and deeply romanticised it is also very slow � possibly the slowest performance of it I have ever heard. Her performance is one of emotive consonance - things are related by attacks, accents and dynamics and there is not too much verticality or bite (not least chordally). Hers is an explicitly linear performance; intensely introspective with the last note held an age. As a performance it stands at a remove from players such as Grumiaux, Milstein, Szigeti � and Enescu himself � and as a monumental piece of introversion. Her Mozart Sonata takes a little time to warm up � she�s not on transcendent technical form in this recital � but sports an attractive slow movement and the C minor Beethoven likewise has patchy moments. In compensation, in this generally measured traversal, one can appreciate the slow and reverential sounding Adagio cantabile. She and her partner, Valentina Lisitsa, play two of the four Romantic Pieces of Dvoř�k. They don�t sculpt these pieces as do Př�hoda and Graef in their live performance � especially the Allegro moderato � which is otherwise attractive though in the Allegro maestoso Haendel and Lisitsa could have made more of the incisive duo aspect � it�s all rather soloist and reticent accompanist here. That encore staple Wieniawski�s Polonaise polishes off the recital splendidly. There are some strongly personalised performances here, captured in good-ish sound with functional notes. Haendel is always exciting to hear, whatever the repertory and whatever one�s own instincts may or may not be. Violinists of her background are not so common that we can easily afford to pass over her discs.